Xiaomi has released the latest MIUI 10 Global Beta 9.3.28 ROM for so many Xiaomi and Redmi series devices. The update is in incremental mode and will take some time to roll out via OTA gradually. We’ve already covered an article based on the MIUI 10 Global 9.3.21 Beta update. If you’re using any Xiaomi device and your device model is listed in the following device list, grab the update from system update option manually. In order to get the Beta update, your device should be installed MIUI 10 Global Beta ROM at first. If you’re running MIUI 9 or MIUI 10 Global Stable ROM, then wait for the official Stable OTA update. It should be available within a few weeks. 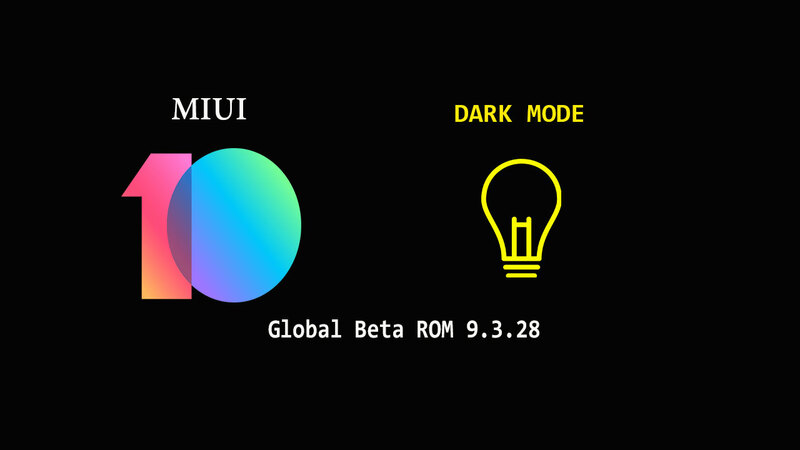 The best part of this update is that now you can use full system dark mode on your MIUI device. Added Dark mode. After opening, the system interface and some applications will use a dark color as the main color. Go to Settings > Display > Dark Mode. Brings Android Security Patch (March 2019) to increase system security. Virus scan start and complete bug fixed. Redmi 3S, Redmi Note 3 Special Edition, Redmi 4X, Mi 5s, Redmi 4A, Mi Max 2, Redmi Note 5A/Redmi Y1 Lite, Redmi Note 5A Prime/Redmi Y1. Mi 6, Mi MIX 2, Redmi Note 5, Mi Note 2, Mi MIX, Mi MIX 2S, POCO F1, Mi 8, Mi Max 3, Mi 8 Lite, Mi MIX 3. Redmi 6A, Redmi 6, Redmi 6 Pro India, Redmi 5A, Redmi 5, Mi Note 3, Mi 5s Plus, Mi 8 pro, Redmi Note 6 Pro. MIUI 10 Global Beta 9.3.28 for Redmi Note 4 Qualcomm / Redmi Note 4X (Mido), Redmi 5 Plus is delayed due to system errors. Update for Redmi S2 is suspended. MIUI 10 Global Beta 9.3.28 update for Redmi Note 5 / Pro based on Android P was released. MIUI 10 Global Beta 9.3.28 for Xiaomi Mi 9, Redmi Note 4 MTK is delayed due to errors.